MAHO KUBOTA GALLERY is pleased to present “The Search For Languorous Magic”, an exhibition of works by Atsushi Kaga, opening March 6th, 2018. A rabbit talking to itself in the mirror; a panda who is just a head and no body; a bear with an injured leg; a young girl whose face changes at night—the world of Atsushi Kaga’s artwork is full of unusual characters. Much of his work contains English text, serving as conversation between these unusually named characters, or as thoughts running through their heads. Often, letting one’s eyes scan this text while taking in the rest of the picture, one finds oneself stopping short in surprise at a biting phrase, or at the dark humor in the scene or its sad yet somehow humorous perspective on life, or at all the little expressions of wonder and astonishment at life’s everyday discoveries—Kaga’s pictures pull their viewers in with their unique sense of humor and fantastic inventiveness. The world depicted in Kaga’s works is no utopia, but neither could we call it dystopian. In Kagaland there are no major incidents, rather just a series of anticlimaxes—the delicate, hard to encapsulate narratives burble along uninterrupted like little streams. Before one knows it, the world on the canvases comes to seem like a reflection of the real world in which we have our homes. Or perhaps, a slight variation on that world—the kind of fantasyland we might find in a novel set in the near future. Try to speak of what Kaga’s body of work actually consists of, and one quickly finds that summarizing it is no easy task. 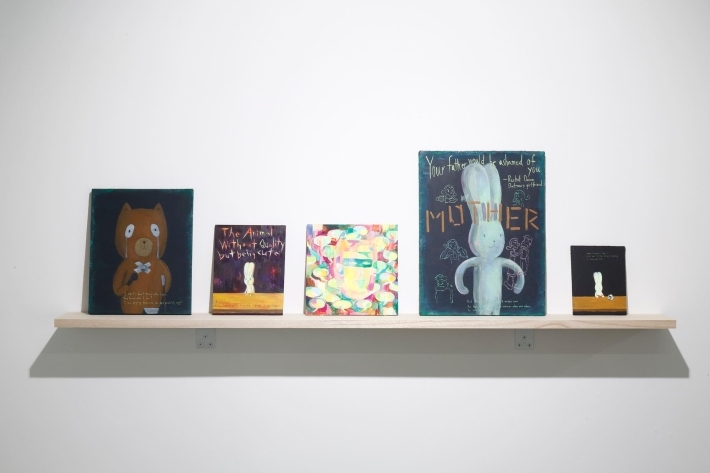 The majority of his pieces are executed in acrylic on small wooden boards, and depict the everyday lives of his characters. 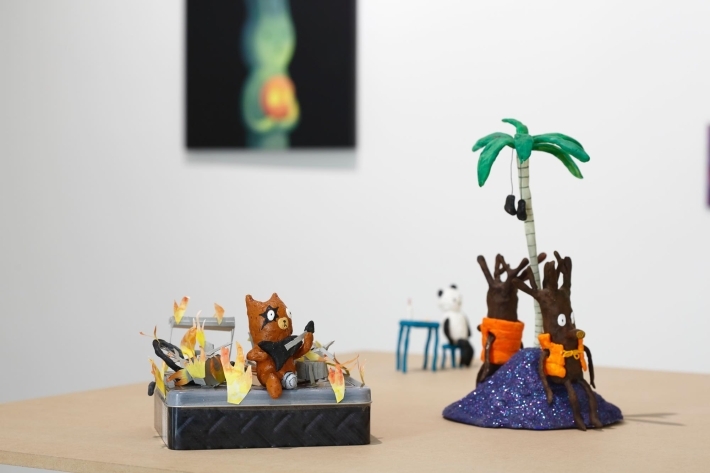 The same characters also appear in other material forms—sometimes as small sculptures, sometimes on canvases. They also make repeated appearances in Kaga’s books. Each time we encounter them, they leave us with certain memorable images or words. This is nonsensical language made visible—the aesthetics of a limbo where time has stopped. The works succeed in transcending their materials and their form of expression to connect and speak with one another, creating their own narratives and reverberations. 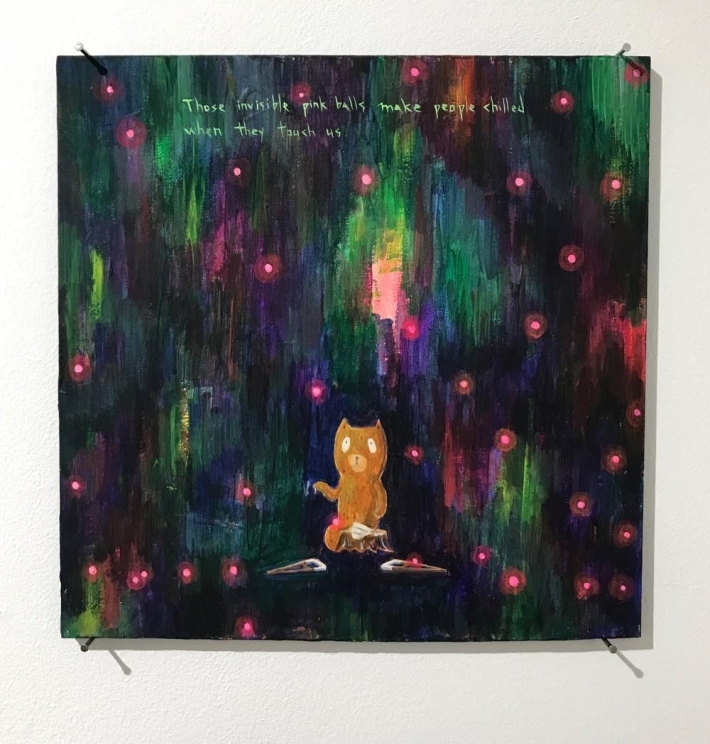 While facing real failure and pain, the inhabitants of Kaga’s world nonetheless live profoundly calm, uneventful lives, and the sense of familiarity that we feel toward them probably originates from the fact that they are in fact close neighbors of ours, as twenty-first century people. Immediately after finishing high school, Kaga moved to Dublin to attend language school, subsequently studying art at the National College of Art and Design there. 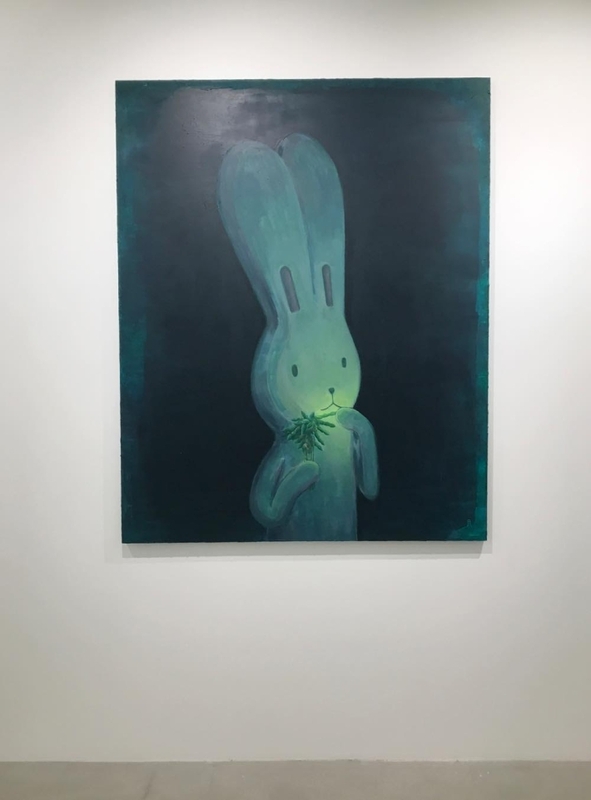 He has now lived away from Japan for about twenty years, and his platform as an artist has always been in Ireland, beginning with his first solo show in a Dublin gallery in 2005. His unconstrained technique and artistic approach show the strong influence his life in Dublin and an Irish way of thinking have had on him, yet there are strong Japanese traces to be found in his style and cultural references too. These two elements come together, sometimes meshing intricately, sometimes bringing discord, but in either case, creating the unique worldview of that provides both the essence of Kaga’s works and its charm. This cultural split may well also provide the reason for the way his take on the world often seems made up of two contradictory elements. 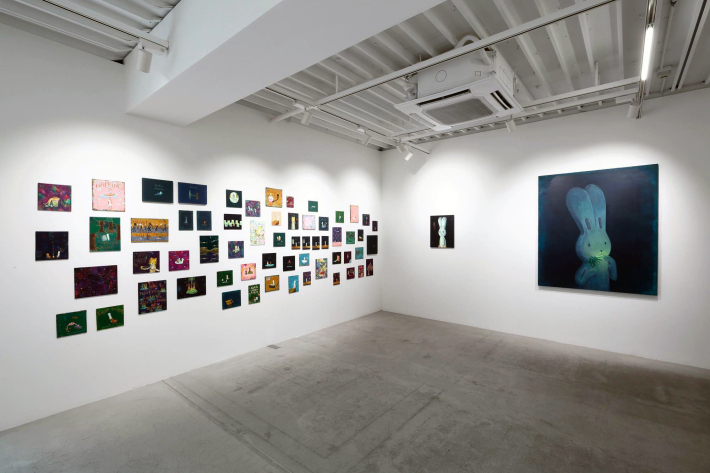 This exhibition, entitled ‘The Search For Languorous Magic,’ is Kaga’s first solo show in Japan. Heavy ‘languor’ combined with uplifting ‘magic’ is an excellent expression of both what Kaga achieves artistically and the way he does it. 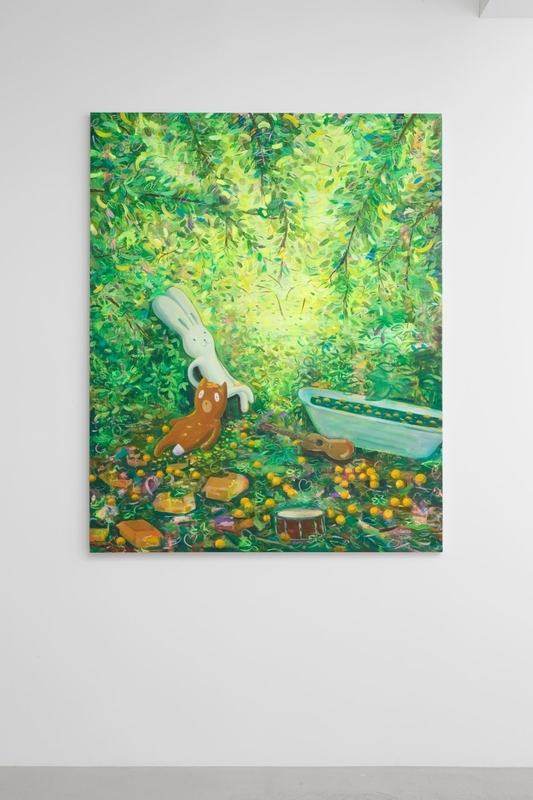 His art is born of two contradictory elements working in tandem, turning its gaze on the stuff of our everyday lives to reveal new discoveries and unfamiliar elements. 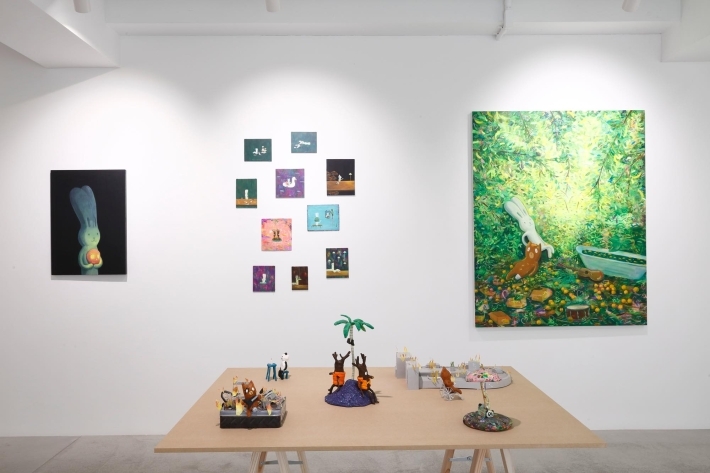 The exhibition combines a characteristic Kaga installation made up of many small pieces on wooden boards with other canvas and sculpture works. This is the first opportunity for a Japanese audience to savor the bizarre world of Kaga—easy to adore, but far less easy to explain.